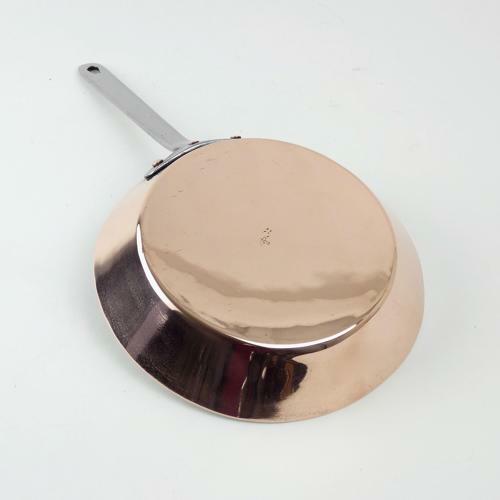 A small, 19th century, English copper omelette pan with a steel handle. This piece is marked, to the base, with the orb and cross symbol used by Benhams and it dates from c.1870. It is made from quite a heavy gauge of copper and it is in excellent condition. The interior has been re-tinned so that it can be used. The pan is 20.5cm. diameter by 3.7cm. deep and the overall length of the pan, with the handle, is 37.7cm. Price includes postage with in the U.K. Shipping to the U.S.A. add £30. Western Europe add £15.